Unfathomable are the ways of mind. We are often times sympathetic to the person committing crime. Extensive philosophies have been written in support of the crimes ascribing it to various Gunas, stellar congregations in ones horoscope, to karma, vagaries of ones own mind and what not. We are also very sympathetic to those who vehemently fight the wrong doers for they are valiant problem solvers who keep the society running by keeping a check on wrong doers. Often times we see them failing but yet we are sympathetic for they have tried. World is also sympathetic to people who run away from the situation and stay aloof for we consider them as ascetics who live above this world of crimes. But have we ever understood the person who stands amidst crime is not fighting against it with valor, is not running away from it, is not part of the crime doers act, but merely smiles at it, deals with it with patience and fortitude. By narrating the story of Shishupala I am merely trying to understand the person standing there smiling. Does he have a plan? Maybe he has a better one. Who is he patient for? Shishupala is the son of Dhamaghosha, the king of Chedi and Srutadeva, the sister of Vasudeva. 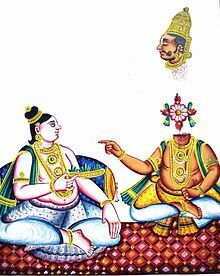 Shishupala the third incarnation of Vijaya was born malformed with three eyes, four hands and four legs braying like a donkey. The sky foretold that his death would be caused by the person who makes these extra limbs to disappear. For lord in his infinite mercy wanted to liberate the Vijaya in Shishupala, touched him and the extra limbs disappeared. Srutadeva blinded by her maternal love could not see the mercy of lord that was willing to give her son the liberation. She made Krishna promise that he would not kill him until he commits 100 transgressions a day each of them meriting a death sentence.The hatred of Shishupala on Krishna grew on this account and also because Rukmini whom he wanted to marry chose Krishna over him. In the court where Yudishtir’s Rajasuya Coronation was about to happen, Bheeshma suggested that the seat of honor be given to Krishna Himself. Sahadeva also supported that thought and said there in none other than krishna who is worthy of this honor present there. This infuriated Shishupala beyond bounds. He uses blasphemous words insulting Krishna’s birth, his lineage, he insults Bheeshma and Sahadeva for proposing his name. Everyone present in court was infuriated they drew their swords to slay him, there were a few who sympathized with Shishupala. There were a few who left the courtroom worried of the consequences of this invective. Balarama was furious on Krishna for letting this even happen and poked form patiently listening. It is Krishna’s answer to Balarama that merits our attention. The wise of the world often don’t realize this simple truth. Not all crimes can be solved by retaliation, communication or by running away. Some problems can only be solved by exhaustion. The problem solvers, the ascetics and crime doers may have many agendas. The person standing there and smiling has only one agenda and that is to exhaust the crime doer so he may be delivered from the crime. We may not find it in our hearts to applaud the person doing that with patience, but least we can do is to understand him.